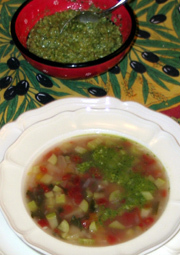 Soup with Pistou is a fragrant mixture of herbs and vegetables which originates from Provence France. In my mind it is an” end of the garden” soup, with a few basic ingredients and then a little of this and that is incorporated. It’s always served with a large dollop of Pistou. The Italians have Pesto containing pine nuts and the Southern French have Pistou which doesn’t include this expensive ingredient. Both are served with pasta and spread on crusty bread. Indeed, this soup is much like an Italian minestrone. Serve with a loaf of good bread, a light red wine, a little cheese on the side and a sweet, crisp, fresh apple for dessert. 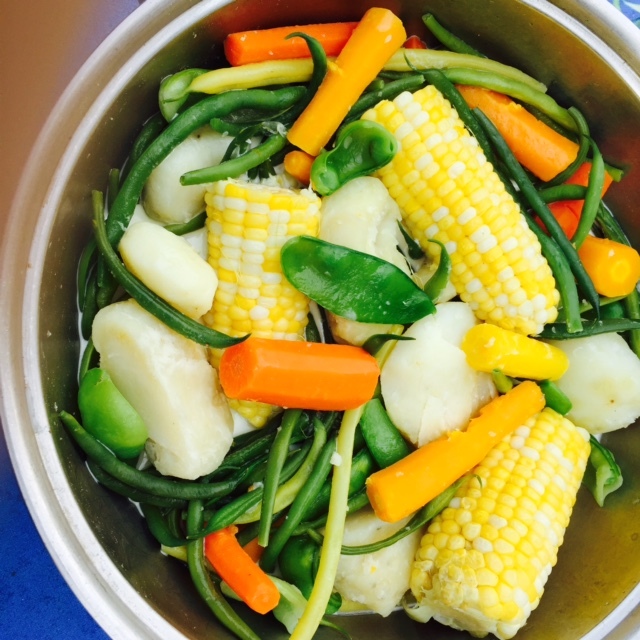 A feast for the gardener cook! Hint: Peel tomatoes by dipping in boiling water for 15 seconds, the skin just slips away. Heat broth with bay leaves. Saute onion, leek and garlic in olive oil until transparent but not showing color. Add this mixture, potato, tomatoes, squash, green beans to simmering broth and cook for ten minutes. Add remaining ingredients and cook for an additional 5 minutes. Remove from heat and let rest five minutes before serving. Remove bay leaves. Pistou should be served along side with each diner stirring in a generous spoonful. Add salt and pepper according to individual taste. This is most easily made in a food processor or blender. Place garlic and basil in food processor with Parmesan cheese. Process for a few seconds, scrape down sides and drizzle in olive oil while turning processor on and off. Lightly process as pistou should be a little chunky. Leftover sauce can be kept refrigerated for 5 days or freeze in an ice cube tray for future use. *Edited October 29, 07. When making the pistou tonight, I discovered my late harvested basil doesn’t have the moisture content it had a few weeks ago. I added three tablespoons water and an extra tablespoon olive oil to get a sauce-like consistency.